Until “A Song Of Ice And Fire”, George R.R. Martin was best known for his science fiction short stories, many of which are set in the same universe. They are set several centuries in the future after humanity has dispersed among the stars. Any semblance of organisation between the colonies ended after a ruinous (but ultimately successful) two-front war against two alien races. The stories are set several centuries after the war, just as some interstellar trade is starting to resume and the connections between the star systems rebuilt. 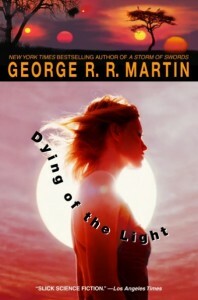 One work set in that universe is Martin's first novel, “The Dying of the Light”, which is little-known compared to “A Song of Ice and Fire”, and was out-of-print until the success of that series increased the demand for Martin's earlier works. It is set on Worlorn, a rogue planet that is drifting through space. For a period of several years this planet passed close enough to a large multiple star system that the conditions there became habitable. For those short years it became host to a great interstellar festival as neighbouring colonies established outposts of their culture on the planet. The book begins as Worlorn is drifting out of range of the star, and the climate is starting to collapse. Most of the population has left the planet, with only a few remaining in the shells of the former festival cities. The main character, Dirk T'Larien, comes to the planet on an infrequent supply ship in response to a message from his former love, Gwen Delvano. She is now married to an important nobleman from the world of High Kavaalan, a colony which fell into barbarism during the great two-front war and has only recently regained interstellar flight. Dirk, who is from a much more advanced world finds a great deal of culture shock as he finds himself caught in a conflict between Gwen's husband and his main rival among the Kavalar, a traditionalist hunter who believes anyone not from High Kavalaan is a ‘mockman’, a soulless mockery of a human. As the confrontation between the two groups of High Kavaalanites becomes violent, and he inadvertently offends one of the hunters, Dirk and Gwen are forced to go on the run, pursued across a dying planet. Martin's characterisation has always been one of his strong points and this book is no exception. The characters are believable, even the Kavalar with their alien culture, as ever with Martin they are also believably flawed and even his protgaonist is not always likeable. Martin paints a convincing picture of a man still deeply in love with a woman who has now moved on from him, and still willing to risk his life to try to protect her from danger. This isn't exactly a cheerful book, the main characters face a lot of hardship as it becomes clear just how out-of-his-depth Dirk is. Martin's well-written, often poetic, prose evokes a very gloomy, wistful atmosphere as he draws parallels between how both Worlorn and Dirk himself don't really have a very meaningful existence any more. The world might not always be described in a huge amount of detail, but it still leaves a very strong impression of a planet of faded glories on the verge of fading completely. There is also a fair amount of suspense as the hunters draw in on their quarry, seemingly able to find Dirk and Gwen wherever they go. The various cultures involved in the book are often intriguing and the abandoned cities left by the various civilisations are a good setting for the chase scenes. One notable thing about the book is its shockingly abrupt ending, as it builds up to a climax then ends just before a final event, its clear how that event should unfold but we never see the final event resolved. It’s a bold move on Martin's part and it works surprisingly well, although it must leave a few “A Song of Ice and Fire” fans worrying about the possibility of him doing the same thing at the end of that series. In summary, this is an impressively well-written book for a debut novel, it might not be quite as brilliant as "A Song of Ice and Fire" but is still a compelling and memorable story.